In an effort to come up with a meaningful BOM program for 2018 in which everyone can participate, Amy decided that the HHQ BOM’s will be in support of community service each year. The first year will be Quilts of Valor. The BOM for 2019 will be for Shriner’s Hospitals/children’s long-term care facilities. The goal is to have enough blocks and quilts to supply local needs. Participants must sign up. The cost is $10. Signing up entitles participants to free kits if the rules are followed. Sign-ups can happen at any time during the year. We may not have previous blocks to offer, but we will do our best to accommodate late starters. Depending on how late one signs up, the only option may be to do the give-back blocks rather than a sampler. Participants can opt to turn in their blocks monthly or keep the blocks and assemble a QOV sampler. Participants can opt to get two blocks each month (one free and one for $5). The second block can be kept or donated. Starting December 1st, we will kick off the program and begin giving out the January block that will be due by January 10th at which time February blocks will be available. Blocks presented after the 10th of each month will be late and the $5 fee will be applied to pick up the next block. Blocks can be turned in any time; however, new blocks are available after the 1st of the following month. This makes the 1st thru the 10th the optimum dates for exchanging and picking up blocks. Participant can have someone bring in their blocks to get the next block, but the $5 fee applies. These are 12” finished blocks and should measure 12 ½” when complete. Please do not square your blocks. A scant quarter inch works best. SIGN UP INSTRUCTIONS: This BOM is in the Class Calendar. Please sign up and pay your $10 either on line or in the shop so that we have a roster of who is participating and can know how many kits to create monthly. PRIZE COMPETITION: Please keep the scraps from these blocks, you may find them useful for future blocks. If you don’t need them, you can turn them in so we can do a scrappy quilt OR you can create your own scrappy 12” block. There will be a judging and competition in December for the best scrappy block from the BOM fabrics. A prize will be awarded! More details to come. 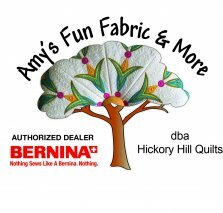 The District Manager told me yesterday that this and other Bernina offers would NOT be repeated in 2018. New 500 Series w Embroidery Module: Get Embroidery Software Toolbox Bundle Free! There are software and bernette/smaller machine specials along the way! Gift Certificates: Anyone who has earned a loyal customer gift certificate in the last few months has discovered that our new point of sale tracks those gift certificates for us – no paper certificates for us to write up, or for you to try to track! It is also a much better situation for the accounting end of the business. After the end of the year, we will no longer honor the old paper certificates, so please, please, please – bring them in and redeem them soon. The rewards program isn't changing, just the method by which we track your rewards. The old thread card reward system will remain the same. 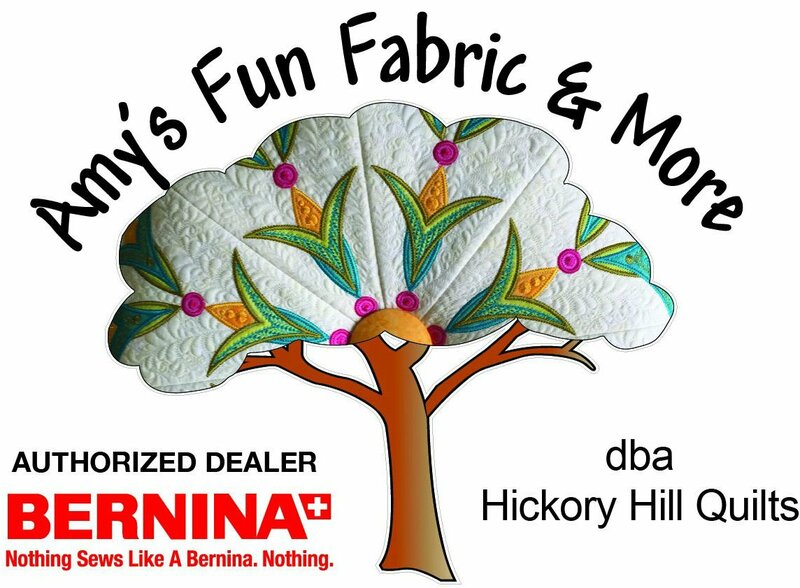 COME SEE US AT HICKORY HILL!! DON'T FORGET THAT 30% ON SAT!! !